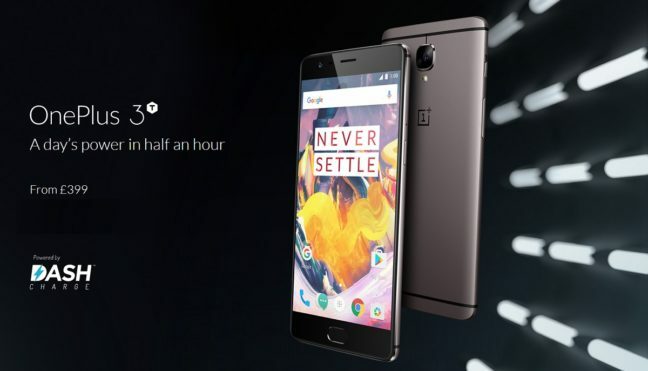 OnePlus announced and released their OnePlus 3 phone not long ago, which is not in production anymore nor available from their website. Now, the company announced a newer refreshed model OnePlus 3T which share the same design from the predecessor. This model of the phone boasts performance with a bit higher specs while giving you the best battery life. OnePlus is a brand known for producing high-spec phones for a cheaper price. What’s new on OnePlus 3T? OnePlus 3T comes with upgraded Snapdragon processor. The original model released with Snapdragon 820 64-bit 2.15 GHz processor, this one coming with Snapdragon 821 64-bit 2.35 GHz processor with 14nm technology. This give a bit of performance boost while bringing the device spec to Google Pixel level. The phone will be performing faster even with big apps or media. Both of the camera used in OnePlus 3T are upgraded from earlier versions. While the megapixel size of the back camera sensor still remain 16MP, now it comes with EIS (Electronic Image Stabilization). With the new processor camera experience is a lot faster. Front camera is now upgraded to 16MP from 8MP on OnePlus 3. This is a great new for selfie lovers. OnePlus upped the battery size to 3,400 mAh in 3T, this is 400 mAh more from the original. That did not increase the size of the phone though, still 7.4mm thin and weights 158 grams. The trick here is, OnePlus used the same battery that comes in OnePlus 3 but they put the voltage of the battery up. Which gives 400mAh more. Similar fast charging equivalent Dash charging is present, which will give you whole day of battery life with 30 minutes of charging. To be honest with you, Dash charging is really fast as I’m using it with my OnePlus 3. OnePlus now offering 64GB and 128GB storage options while similar 6GB of RAM size. Storage option is non-expandable, you need to choose from given 2 sizes. OnePlus 3T will come with Oxygen OS 3.5.1 which is similar to Android 6.0.1 Marshmallow. Will be updated to Android 7.x (Nougat) soon. More likely next month as Christmas present. They tried to keep the user interface as close to stock as possible. Similar as OnePlus 3 without any visible changes. If you are an OnePlus 3 user or recently bought one, you don’t need to panic. Both of the devices will receive updates at the same time. OnePlus 3T being a new device doesn’t mean it will receive any update earlier. Yes, price has changed as well, now it’s £70 more. OnePlus 3T will go on sale from OnePlus.net website from 28th November, 2016. Listed price for the 64GB model is £399 There is no pre-order option from the manufacturer’s website. I believe, they will sell out as soon on launch date due to high demand of these smartphones. O2, the best UK network voted for customer service 7 years in a row will be carrying it exclusively in the UK. They are taking pre-orders for OnePlus 3T. Price starts from £31 per month with £9.99 upfront cost on a 24 months O2 Refresh plan for the 64GB model. And, £33 per month with no upfront cost for the 128GB model. This O2 Refresh plan will give you 500MB data, 500 minutes and unlimited texts. If you want more data, the price will go up accordingly. Visit O2 website to pre-order yours. I had hands on experience of the OnePlus 3T yesterday at an event in London. Though, visually there is no difference, but it was really cool and now I’m planning to get one. If you already have an OnePlus 3, there are not much great reasons to upgrade your phone now. What do you think about the OnePlus 3T? Let us know in the comment or in our Facebook page.